Durability of the implanted prosthesis has been the goal of total knee arthroplasty (TKA) since the earliest days of the procedure. And, it’s been achieved: At the recent ICJR East ISK Hip & Knee Course, Mark W. Pagnano, MD, from Mayo Clinic in Rochester, Minnesota, reported that combined registry data show about a 1.25% risk of TKA revision per year – which means the vast majority of TKA patients will have a knee that will last them 10 to 30 years. Orthopaedic surgeons are now turning their attention to improving function of the knee, hoping to close the “satisfaction gap” between total hip and total knee patients. Some surgeons are looking at solving alignment issues with computer navigation and/or robotics, other are considering whether advanced sensor-tensor devices can help with ligament balancing, and still others are investigating new implants to preserve the anterior cruciate ligament. Dr. Pagnano has a different approach to the surgical technique for TKA: He views the 3-dimensional position of the femoral component in space as the prime driver of total knee function, no matter which implant design is used. This approach results in unintended consequences on the femoral side that can explain at least some of the issues with knee function in TKA, Dr. Pagnano said. For example, a tibia cut in 0° changes the joint surface in most knees, resulting in a relative over-resection laterally in extension and flexion. The surgeon must then make changes on the femoral side, either under-resecting laterally in extension or doing a medial ligament release to balance the flexion gap. This adds 3° of external rotation in flexion. 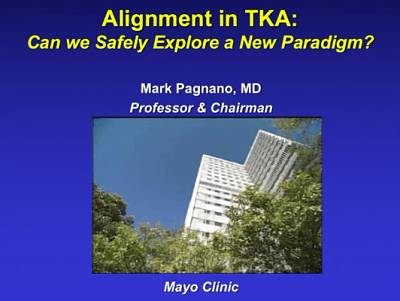 Is it time to explore a new alignment paradigm that could improve function in TKA patients? Click on the image above to hear Dr. Pagnano’s answer to that question and learn more about his approach to the femur and tibia cuts. Dr. Pagnano has disclosed that he has product development agreements with DePuy Synthes and Stryker.